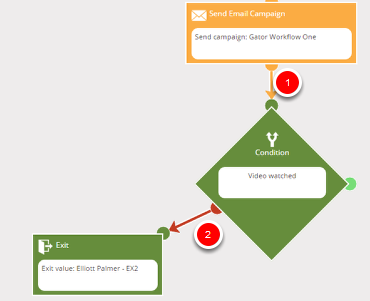 In this exercise we look at cloning a Workflow and introducing a condition. 1. Select 'Copy a Workflow' from the drop down menu. 4. Make sure the Workflow is held in the Workflow training folder. 1. Delete the wait stage from your current Workflow. 2. 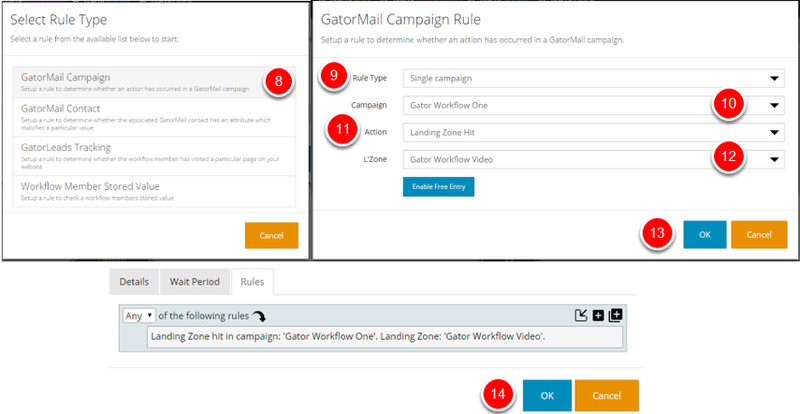 Now link the entry stage to the 'Send Email Campaign - Gator Workflow One' stage by dragging from entry to the desired stage. 3. Delete the link from the 'Send Email Campaign' stage to the exit stage by selecting the link bar. 1. Drag and drop a condition stage on to the canvas. 2. Under the description add 'Video watched'. 3. Select the 'Wait Period' tab. 4 Select 'Execute rules periodically until a wait period is reached'. 5. Set the hours to 24. 8. Select the rule type of 'GatorMail Campaign'. 2/3. Do not supply an exit value & Click OK.